The quarterly Tankan Survey is Japan's most important economic assessment. The reading for large manufacturing firms is the bellwether for the report. The large firm index is off for the third quarter running and some are making a lot of that. But the index also is off from its 15-year high in Q4 2017. So while there is a steady slide, it is also from a 15-year peak reading. The large manufacturing firm reading has been higher than its Q3 vale only about 26% of the time. The large enterprises in nonmanufacturing have seen their index higher less than 18% of the time. The all industry large enterprise gauge has been higher only about 16% of the time. These readings mark the Tankan as still quite strong - even in the face of three straight quarters of slippage. The Tankan also is equipped with an outlook index. The large enterprise manufacturing index has been fluctuating in a range from 19 to 21 over the last five quarters. The peak reading in this period occurred last quarter at a level of 21; this quarter the reading has slipped to 19. But at a diffusion value of 19, the manufacturing sector still has an 82.5 percentiles queue standing, putting in the top 18% of its historic queue of values. Manufacturing has an outlook that ranks fifth over the last 15 years while the nonmanufacturing outlook ranks third. Despite the focus on how Japan is slipping, the counterpoint is that Japan is holding to some every high levels of activity and its slippage has been slow and measured. Japan's PMI reading for manufacturing in September is weaker in some ways than its Tankan reading. Manufacturing has a 65th queue percentile standing over the last five years of data and a raw diffusion score of 52.5 which is a moderately positive reading. 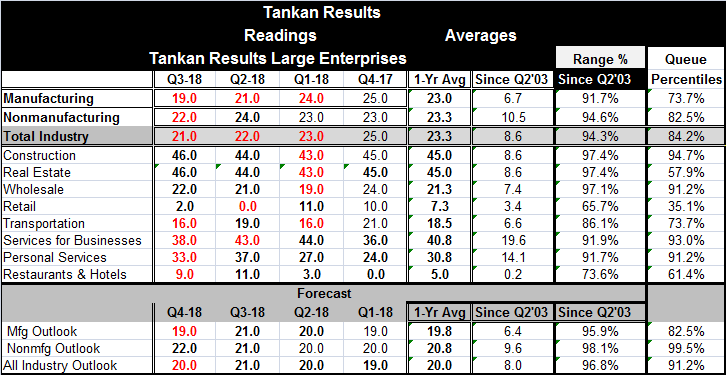 The Tankan standing for manufacturers over a longer period is near the top one quarter of its historic queue of data in comparison. Europe has shown more economic slippage than Japan and the Bank of Japan may be in less of a pickle than the European Central Bank in that regard. In the U.S., economic data are still strong and while inflation is not really excessive it is at target and the Fed still has a clear path to continue to hike rates. In the U.K., an unexpected rise of inflation has created a quandary for the BOE, or it will if the unexpected spurt does not reverse and particularly if there turns to be a 'Hard Brexit' which is the most disruptive economic scenario for both the U.K. and for Europe. All in all, the global scene is in flux. And paths that central banks have been carefully planning out for themselves are no longer such smooth-going. Even in the U.S., the part for the Fed is only clear for now and the fact of still-contained inflation despite what appears to be a very tight labor market in the economy still has economists and policymakers scratching their heads, and as the dandruff is cascading all over the shoulders of their blue suits, they are nonetheless giving guidance on a future they do not come close to understanding. Needless to say, these are very interesting economic times. There is good reason to wake up every day and read the papers and scrutinize each and every economic report. The truth is out there somewhere. We just have to find it. But you won't find it reading anything written by central banks because they are too burdened with dogma.